A Vaisala CT-25K ceilometer was installed at an old-growth forest site located at the km 67 Eddy Flux Tower site in the Tapajos National Forest, Para, Brazil, off Kilometer 67 of BR-163 south of Santarem in April 2001 and remained operational through December 2003, with reliable data being collected between May 2001 and June 2003. Annual, 2001 to 2003, 30-minute average cloud base and backscatter profile data and measurement statistics (sample count, variance, skewness, and kurtosis) are presented in 15 ASCII comma-delineated files. In addition, the cloud base values (m) and measurement statistics for the three reported cloud base levels have been consolidated in three annual comma-separated files. The ceilometer provides 15-second measurements of cloud base (three levels up to 7500 m), echo intensity, and a 30-m resolution backscatter profile. The ceilometer reports vertical visibility during periods when the sky is obscured but a cloud base is not detectable. The ceilometer was operational for a sufficient amount of time to examine wet-to-dry season variations in cloud cover fraction and cloud base height. Vaisala CT-25K ceilometer as installed at the old-growth forest site located at the km 67 Eddy Flux Tower site in the Tapajos National Forest. This data set was archived in August of 2009. Users who download the data between August 2009 and September 2014 must comply with the LBA Data and Publication Policy. 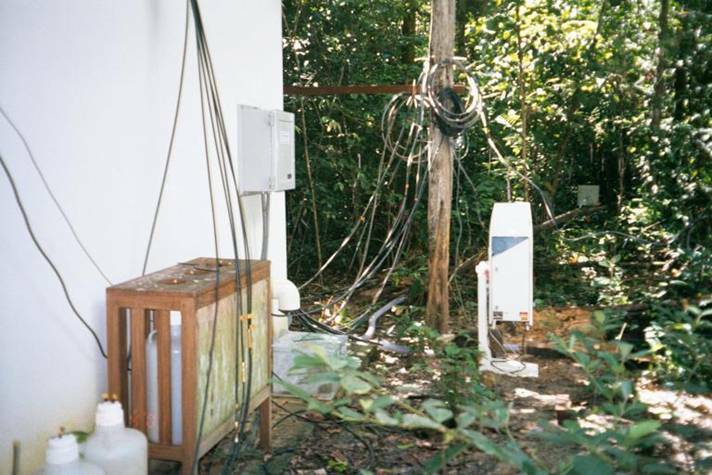 A Vaisala CT-25K ceilometer was installed at an old-growth forest site located at the km 67 Eddy Flux Tower site in the Tapajos National Forest off kilometer 67 of BR-163 south of Santarem in April 2001 and remained operational through December 2003, with reliable data being collected between May 2001 and June 2003. LBA-ECO CD-10 CO2 and H2O Eddy Fluxes at km 67 Tower Site, Tapajos National Forest (includes tipping bucket rainfall data from the same site). Annual, 2001 to 2003, 30-minute average cloud base, backscatter profile data and measurement statistics (sample count, variance, skewness, and kurtosis) are presented in 15 ASCII comma-delineated files. There are several data gaps in each file that are noted in Section 4. In addition, the cloud base values (m) and measurement statistics for the three reported cloud base levels have been consolidated in three annual comma-separated files. For each year, the 30-minute average cloud base with backscatter and measurement statistics including the sample count, variance, skewness, and kurtosis are reported in separate ASCII comma-delineated files -- 5 files per year for a total of 15 files. Where data-type will be Backscatter, Sample_Count, Variance, Skewness, or Kurtosis and YYYY will be 2001, 2002, or 2003. Following is an example of the header for a Backscatter data file. Note that columns 5-7 contain the Cloud Base heights (m) that were derived from the backscatter profile measurements. Columns 8-258 are the 30-minute average backscatter values at the indicated heights. For the Sample_Count, Variance, Skewness, and Kurtosis data types, the file structure is the same as Backscatter, but the values are the measurement statistics for the respective Backscatter value. For example, in CD03_Ceilometer_Sample_Count_2001.csv, columns 5-7 contain the Sample Count for Cloud Base height values at level 1, 2, and 3, respectively. Values in columns 8-258 are the number of 15-second measurements included in the respective 30-minute backscatter averages at the indicated heights. Example Backscatter data file header: (Headers are not shown for the other data types). File generated by ceilHexavg1.f - avg. per.= 30 min with post-processing using SAS to reformat data file as csv and remove padded blank spaces. 2 Day Decimal day of year (GMT). Note: The values are the middle of the 30-minute averaging period. Local time is GMT-4. 3 Hour Decimal hour of the day (GMT). Note: The values are the middle of the 30-minute averaging period - 5.25 represents the average for the 05:00-05:30 time period. 4 Seconds Number of seconds into the day (GMT). Cols 8-258 Backscatter_height 10000*srad*km Data are range and sensitivity normalized backscatter. There are 251 values, representing the average of 15 second backscatter measurements from 0 to 25000 feet at 100-foot (~30 m) resolution. The first value (column 8) is the backscatter at a height of 0 feet, column 9 is the backscatter at a height of 100 feet, and column 258 is the backscatter at 25000 feet. Note that 258 columns will not load completely into an Excel 2003 spread sheet because of the 256 column limit. Excel 2007 has no such limit. The cloud base values (m) and measurement statistics for the three reported cloud base levels (columns 5, 6, and 7 for each data type) have been consolidated in 3 annual comma-separated files. Where YYYY will be 2001, 2002, or 2003. 2 Day Decimal day of year (GMT). Note: The values are the middle of the 30-minute averaging period. The data set covers the period 2001/04/07 to 2003/12/20. Temporal Resolution: Almost continuous data set. Ceilometers have been used to observe boundary-layer aerosols (e.g. Zephoris et al. 2005) and boundary-layer mixing height (e.g. Eresmaa et al. 2006). The ceilometer is also able to detect rain droplets quite well through the use of the ceilometer backscatter profile. The rain droplets are a large target for the laser compared to other aerosols; therefore a strong, distinct return signal is seen from the cloud base to the surface on the backscatter profile. By determining a return-echo threshold value for rain droplets, rain events can be detected from the ceilometer backscatter profile. The threshold value can be verified using tipping-bucket rain gauge data from the same site. Using the ceilometer data complements the traditional rain-gauge approach as the ceilometer detects all rain events, including light ones when the rain gauge may not catch any rainfall due to wind, etc. or not enough to force a tip. Second, the ceilometer gives the instantaneous start time for precipitation, whereas with the tipping bucket rain gauge, light precipitation may have been falling for several minutes before the first tip is recorded. The variables calculated include the backscatter coefficient Beta(z) at profile heights from the surface to 25,000 feet at 100-foot (~30 m resolution), and is internally calculated by the software. The cloud-base heights (up to three) are also internally calculated by the software. The raw data provided by the ceilometer were cloud-base and backscatter profile information reported every 15 seconds. From these data, an averaging program was used to calculate the statistical moments (mean, variance, skewness, and kurtosis) of the cloud-base and backscatter profile at 30-minute intervals. Each cloud base level was averaged, as well as backscatter profile level. A value of -9999 was assigned if no cloud base was reported during the interval. No further processing of the raw data from the ceilometer was done before the averaging program was run on the data. No changes or special corrections were made to the data during processing. Potential sources of error may come from contamination of the ceilometer window by dirt or debris. From the users guide, in these instances it is stated that cloud height information is correct if it is detected. If cloud base heights are not detected, high clouds may be missed. Direct rain drops on the window are also a potential source of error. However, this has a minimal impact because the ceilometer was equipped with an internal blower which automatically turns on when droplets hit the window to keep the window dry in such cases. There are no known instances of the data-processing algorithm being unreliable. For the ceilometer used at the km 67 LBA site, the ceilometer window had a special protective coating applied to it for use in tropical environments. The window coating reacted with the environmental conditions (heat, humidity), causing pitting and permanent contamination of the window over time. Data collected after June 2003 had continuous warning messages reported; such data should be used with caution. Data collected in June 2003 or earlier had no continuous warning messages reported and are considered good. data set. No gap-filling was performed to this data set. Primary reasons for data gaps are either power outages (failed generator) or a shutdown in the data-acquisition computer or data-acquisition programs running on that computer. Known prolonged data gaps are listed below. The ceilometer was installed in April 2001, with the first good data being collected on May 1, 2001 (day-of-year 121). All collected data were plotted and visually inspected by the submitter following processing for validation. Numerous repeated data lines were removed during this process. Data collected until June 2003 are considered good. Continuous warnings were reported from the ceilometer after June 2003 due to window contamination; therefore data collected after June 2003 are not considered good. Cloud-base measurement accuracy is 50 feet (~15 m). A Vaisala CT-25K ceilometer was installed at the km 67 Eddy Flux Tower site between April 2001 and December 2003, with reliable data being collected between May 2001 and June 2003. The CT-25K ceilometer employs pulsed diode laser LIDAR technology (LIDAR=Light detection and ranging), where short, powerful laser pulses are sent out in a vertical or near-vertical direction. The reflection of light - backscatter - caused by haze, fog, mist, virga, precipitation and clouds is measured as the laser pulses traverse the sky. The resulting backscatter profile, i.e. signal strength versus height, is stored and processed and the cloud bases are detected. Knowing the speed of light, the time delay between the launch of the laser pulse and the detection of the backscatter signal indicates the cloud base height. The CT25K is able to detect three cloud layers simultaneously. Along with cloud base measurements the ceilometer provided 15 second measurements of a backscatter profile from the surface to 25000 ft at 100 ft resolution. Data from the ceilometer were sent out via an RS232 serial stream and collected on a Linux computer that also collected eddy-flux data, temperature, wind, humidity and CO2 profiles as well as radiation data. The time stamps on the ceilometer data therefore correspond to these other measurements collected at this site. Due to the large amounts of data in each backscatter profile raw 15 second data was averaged to 5 minutes to perform rain identification analysis. Please note the 30-minute averaged ceilometer data submitted to this archive were created using the same averaging programs as the 5-minute-averaged data used in the rain-event identification analysis. The threshold value for precipitation was found to be between 1.2 and 1.5 (units are log(1000*srad*km)-1) based on the review of many days of rainfall data from a tipping bucket gauge at the same site. Histograms of backscatter intensity showed the largest decrease in the number of observed backscatter densities between 1.2 and 1.3 indicating the rain threshold since most of the time it is not raining. Thus we used a rain threshold value of 1.3. Additionally the heights at which to average the backscatter profile needed to be determined. Backscatter profile data was averaged three ways; first the lower 90 m (three range gates), second the lowest level up to 75 % of the cloud base height and finally the lowest level up to 50% of the cloud base height. Averaging the backscatter profile up to 50 % of the cloud base height produced the best results. Additional details on ceilometer measurements and calculation of cloud base and backscatter is provided in the companion file, CD03_Ceilometer_Km67_Methods.pdf. Eresmaa, N., A. Karppinen, . M. Joffre, J. Rasanen, and H. Talvitie, 2006: Mixing height determination by ceilometer. Atmos. Chem. Phys., 6, 1485-1493. Vaisala Oyj: Ceilometer CT-25K User's Guide. Vantaa, Finland, 2002, 161 pp.